I cannod install phpmyadmin. The installation process fails with the following error. I can normally log in to the mysql database. What should I do? Normally I would expect "(using password: Yes)". What is making apt to not to bother to give the password?. I am using Debian 9 installation that is pretty fresh and installed on a clean hard drive. 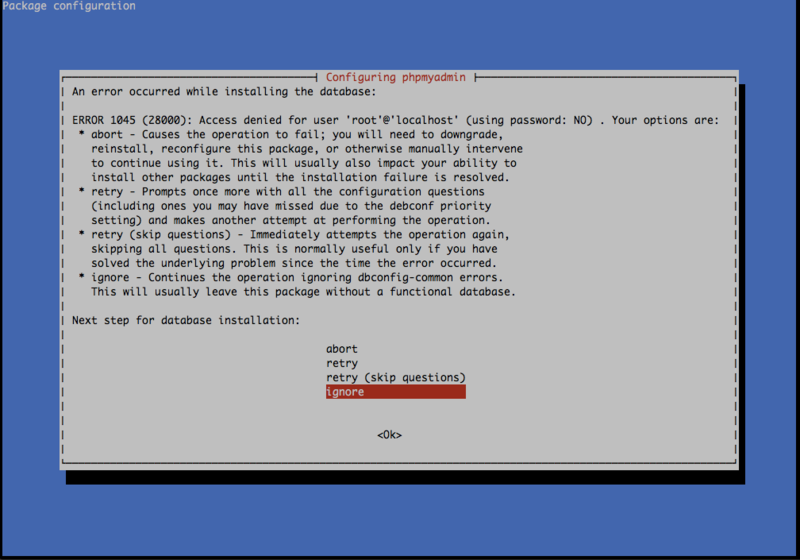 Additionally AFAIK "dpkg-reconfigure mysql-server" should ask for root password. In my case nothing happens - command quits after one second. Solution 1 The trick was: set "SET PASSWORD FOR root@localhost=PASSWORD('')" apparently dbconfig-common works only if the password is empty. Not the answer you're looking for? Browse other questions tagged debian apt mysql phpmyadmin or ask your own question. phpmyadmin held back, why and how to fix it?